The United Kingdom Hydrographic Office (UKHO) has published chart Q6099 Anti-Piracy Planning Chart – Red Sea, Gulf of Aden and Arabian Sea for a number of years. This chart has now been incorporated into a new series of Maritime Security Planning Charts (Q Series). Q6099 – Anti–Piracy Planning Chart – Red Sea, Gulf of Aden and Arabian Sea: This Anti-Piracy chart has been included because it was the first in the Q series and the information it contains is aimed at the piracy threat, it is still very current and is considered a useful part of this tool set for use by mariners. The new set of Q charts build on the original concept of Q6099 but have been further developed to cover a broader subject area by containing Security Related Information to Mariners (SRIM). 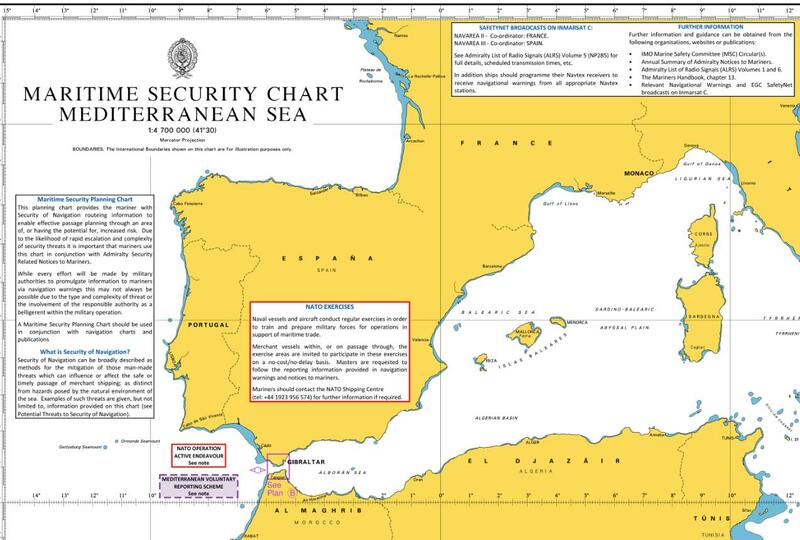 Q6110 – Mediterranean Sea: This chart is one of a series of new Maritime Security Charts that contains security related information to mariners for the geographical area of this chart. It also includes the details of reporting schemes and regional contacts, as well as general security advice and is to be used in conjunction with standard nautical charts and publications. 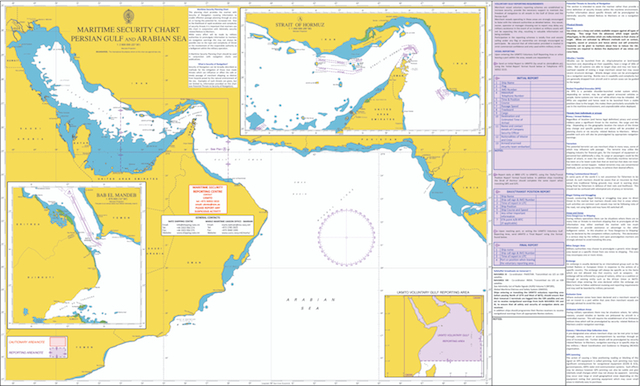 Q6111 – Persian Gulf and Arabian Sea: This chart is one of a series of new Maritime Security Charts that contains security related information to mariners for the geographical area of this chart. It also includes the details of reporting schemes and regional contacts, as well as general security advice and is to be used in conjunction with standard nautical charts and publications. The two new charts in the series build on the concept of the original anti-piracy chart and contain additional security related information for mariners, including security advice, reporting schemes and contacts. The security planning charts are to be utilised in conjunction with normal navigational charts used for passage planning. The charts will be corrected, as necessary, by Admiralty Notices to Mariners. Security related information, for example, new exclusion zones or threats will be promulgated by means of Security Related Information to Mariners (SRIM).